In a recent gathering of CFA Members it was suggested that we have a space to compile a list of books on conservation that are highly recommended by other members. Such a list has been compiled below with information about the books as well as why our members have enjoyed them. We hope that our members are inspired to read, learn, and share together through books on conservation. If you have a book you would like to recommend, please send the title as well as a description up to 150 words on why you suggested it. 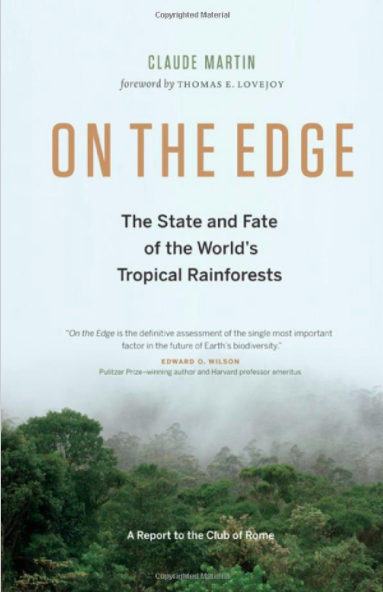 Dr. Claude Martin, the former Director General of WWF International for 20+ years, has written an exceptional book entitled, On the Edge: The State and Fate of the World's Tropical Rainforests. On the Edge provides an excellent overview of the historical causes of deforestation and degradation and provides a much needed, contemporary outlook on the fate of rainforests across the major tropical regions. Incorporating specialist views on a range of related topics including the role of climate change and the rights of indigenous peoples, Dr. Martin’s On the Edge is an invaluable resource for those interested in the future of tropical rainforests and for those interested in how we got to where we are today. With 15+ years of tropical rainforest experience and after 60+ interviews with leading practitioners, Mr. McFarland’s Conservation of Tropical Rainforests provides an historical overview of numerous conservation finance tools including debt-for-nature swaps, payments for ecosystem services, and ecotourism. The book’s greatest contribution is 24 in-depth case studies spread across 15 countries and four continents. One such case study is of the Purus Project, a forest carbon offset project that Mr. McFarland has been involved with since 2011. The Project is the first ever REDD+ (Reducing Emissions from Deforestation and forest Degradation) project in Acre, Brazil – one of the world’s leading jurisdictions working on subnational accounting of deforestation - to be independently validated and verified to the leading voluntary carbon certification standards known as the Verified Carbon Standard (VCS) and to the Climate, Community and Biodiversity Standard (CCBS). The Project also achieved CCBS Gold Distinction for exceptional biodiversity benefits. To learn more, please visit: https://link.springer.com/book/10.1007/978-3-319-63236-0 or https://www.amazon.com/dp/3319632353. "Whether this is your first exploration of inner space, or you’ve devoted your life to the inward journey, this book will transform your relationship with yourself and the world around you. You’ll discover what you can do to put an end to the habitual thoughts and emotions that limit your consciousness. By tapping into traditions of meditation and mindfulness, author and spiritual teacher Michael A. Singer shows how the development of consciousness can enable us all to dwell in the present moment and let go of painful thoughts and memories that keep us from achieving happiness and self-realization. 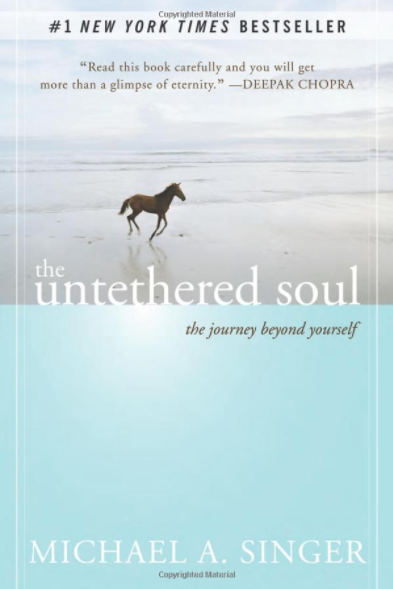 Copublished with the Institute of Noetic Sciences (IONS) TheUntethered Soul begins by walking you through your relationship with your thoughts and emotions, helping you uncover the source and fluctuations of your inner energy. It then delves into what you can do to free yourself from the habitual thoughts, emotions, and energy patterns that limit your consciousness. Finally, with perfect clarity, this book opens the door to a life lived in the freedom of your innermost being." "Explores how “clean money” is transforming capitalism by powering sustainable businesses that build social and financial equity and change the world. Part memoir of an inspiring thought-leader’s journey from presidential campaigner to multi-millionaire investor, part insider’s guide to the businesses that are remaking the world, and part table-pounding manifesto for innovative investors and entrepreneurs." "Sinek starts with a fundamental question: Why are some people and organizations more innovative, more influential, and more profitable than others? Why do some command greater loyalty from customers and employees alike? Even among the successful, why are so few able to repeat their success over and over? START WITH WHY shows that the leaders who've had the greatest influence in the world all think, act, and communicate the same way -- and it's the opposite of what everyone else does. Sinek calls this powerful idea The Golden Circle, and it provides a framework upon which organizations can be built, movements can be led, and people can be inspired. And it all starts with WHY." "In the past five years, the business world has seen the birth of a new breed of company—the Exponential Organization—that has revolutionized how a company can accelerate its growth by using technology. An ExO can eliminate the incremental, linear way traditional companies get bigger, leveraging assets like community, big data, algorithms, and new technology into achieving performance benchmarks ten times better than its peers. Three luminaries of the business world—Salim Ismail, Yuri van Geest, and Mike Malone—have researched this phenomenon and documented ten characteristics of Exponential Organizations. Here, in Exponential Organizations, they walk the reader through how any company, from a startup to a multi-national, can become an ExO, streamline its performance, and grow to the next level." "As long as businesses are set up to focus exclusively on maximizing financial income for the few, our economy will be locked into endless growth and widening inequality. 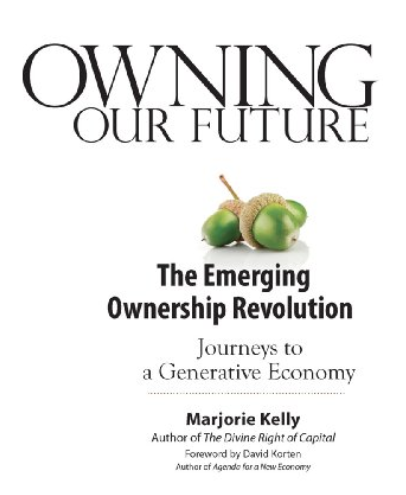 But now people are experimenting with new forms of ownership, which Marjorie Kelly calls generative: aimed at creating the conditions for life for many generations to come. These designs may hold the key to the deep transformation our civilization needs. To understand these emerging alternatives, Kelly reports from all over the world, visiting a community-owned wind facility in Massachusetts, a lobster cooperative in Maine, a multibillion-dollar employee-owned department-store chain in London, a foundation-owned pharmaceutical company in Denmark, a farmer-owned dairy in Wisconsin, and other places where a hopeful new economy is being built. Along the way, she finds the five essential patterns of ownership design that make these models work." "Courageous leaders today are calling for a disruptive yet effective way of working: one that unlocks significant new levels of innovation, delivers enduring financial results, and creates exceptional customer loyalty while simultaneously building human capacity to contribute to on-going positive change. The good news is there is a proven, but infrequently taken, path. Through a fundamentally contrasting paradigm, Carol Sanford shows leaders why today's so-called business "best practices" undermine success-and then, how to transform their business into something so flexible, so innovative, so developmental, it becomes virtually non-displaceable in the market. The Regenerative Business is built by connecting every person in the business to the "essential core" of that business - its unique foundation for innovation and market power. This provides the fulcrum for an organizational culture that embraces the internal destabilization and discomfort that comes with responding creatively to the unfamiliar. The payoff for doing so is a motivated and innovative workforce that is prepared to take a business to the top of its industry - and stay there." "Andrea Wulf brings Alexander von Humboldt and his achievements back into focus: his daring expeditions and investigation of wild environments around the world and his discoveries of similarities between climate and vegetation zones on different continents. She also discusses his prediction of human-induced climate change, his remarkable ability to fashion poetic narrative out of scientific observation, and his relationships with iconic figures such as Simón Bolívar and Thomas Jefferson. Wulf examines how Humboldt’s writings inspired other naturalists and poets such as Darwin, Wordsworth, and Goethe, and she makes the compelling case that it was Humboldt’s influence that led John Muir to his ideas of natural preservation and that shaped Thoreau’s Walden. With this brilliantly researched and compellingly written book, Andrea Wulf shows the myriad fundamental ways in which Humboldt created our understanding of the natural world, and she champions a renewed interest in this vital and lost player in environmental history and science." "Most of us want to make a difference. We donate our time and money to charities and causes we deem worthy, choose careers we consider meaningful, and patronize businesses and buy products we believe make the world a better place. Unfortunately, we often base these decisions on assumptions and emotions rather than facts. As a result, even our best intentions often lead to ineffective—and sometimes downright harmful—outcomes. How can we do better? While a researcher at Oxford, trying to figure out which career would allow him to have the greatest impact, William MacAskill confronted this problem head on. He discovered that much of the potential for change was being squandered by lack of information, bad data, and our own prejudice. As an antidote, he and his colleagues developed effective altruism, a practical, data-driven approach that allows each of us to make a tremendous difference regardless of our resources. Effective altruists believe that it’s not enough to simply do good; we must do good better." "In Cows Save the Planet, journalist Judith D. Schwartz looks at soil as a crucible for our many overlapping environmental, economic, and social crises. Schwartz reveals that for many of these problems―climate change, desertification, biodiversity loss, droughts, floods, wildfires, rural poverty, malnutrition, and obesity―there are positive, alternative scenarios to the degradation and devastation we face. In each case, our ability to turn these crises into opportunities depends on how we treat the soil." "In Keeping the Wild, a group of prominent scientists, writers, and conservation activists responds to the Anthropocene-boosters who claim that wild nature is no more (or in any case not much worth caring about), that human-caused extinction is acceptable, and that “novel ecosystems” are an adequate replacement for natural landscapes. With rhetorical fists swinging, the book’s contributors argue that these “new environmentalists” embody the hubris of the managerial mindset and offer a conservation strategy that will fail to protect life in all its buzzing, blossoming diversity. 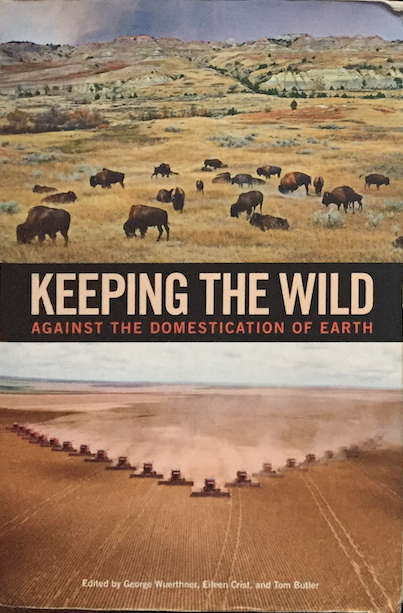 With essays from Eileen Crist, David Ehrenfeld, Dave Foreman, Lisi Krall, Harvey Locke, Curt Meine, Kathleen Dean Moore, Michael Soulé, Terry Tempest Williams and other leading thinkers, Keeping the Wild provides an introduction to this important debate, a critique of the Anthropocene boosters’ attack on traditional conservation, and unapologetic advocacy for wild nature." "Escalating environmental threats, including those associated with climate change, demand new types of responses to preserve the integrity of the world’s ecosystems. Implementing these conservation responses requires significant financial resources from both the public and the private sector. Conservation organisations have been experimenting with ways to attract private sector partners to help meet this financing demand. It is now time to consolidate our understanding of such early experiences, identify best practices, and work towards achieving impact at scale. This report seeks to inspire investments in conservation, and sustainability more broadly, by providing a practical framework for evaluating opportunities and showcasing real world examples of conservation finance. It discusses how conservation organisations can conceptualise investment opportunities that amplify and accelerate their activities. This report also analyses the different roles these organisations can play in mobilising private capital and reviews essential considerations for effective delivery of conservation investments. Besides addressing conservation organisations, it also seeks to inform investors willing to allocate capital in ways that yield positive environmental and social impacts alongside financial returns."